Eternal Return shows that Windhand are ready to make some adjustments to their formula and do so in all the right ways. This isn’t the first time I’ve put on my writing glasses and penned a review for Windhand, but last time was for their split with fellow Virginians, Satan’s Satyrs. While that was a solid outing, it was for better or worse, an on the nose interpretation of the Windhand formula. For Eternal Return, the band teamed up with famed producer, Jack Endino (Nirvana, Mudhoney). While I have and always loved this band, the time has come for them to get a bit of a creative nudge. It’s nice to see that they are self-aware enough to realize this and bring on such a talent to assist with their new record. Endino brings some grunge sensibilities along with him, which found their way into the record, and it fits the band quite well. Of course, that’s not to say that psychedelia is gone by any means; it’s here, in full force as well. The formula has been tweaked, not rewritten. Opening up with the atmospheric “Halcyon”, the pace is a little more upbeat than I anticipated. It’s still heavy, and that thick tone and wide-as-hell wall of sound is still present, so the trademarks are still intact, but the melody is snappy. This is a trend that runs through the album and the record is better for it. This is really evident in the rock ballad-esque “Pilgrim’s Rest”, which is slower but isn’t nearly as heavy. The movements are melancholy and the lighter instrumentation really allows Dorthia Cottrell’s voice shine. “Light Into Dark” is a nice instrumental segue to the back half of the album, with lots of fuzz and plenty of tasty licks. It’s around the halfway point that we begin hearing more of the slight changes that Windhand made for this record. The four-minute track “Red Cloud” is one such track that embraces the heavy riffing that the band is known for, and also shakes up the melodicism even more. Again, the pace is nice, chord progressions happen sooner, and the grunge surfaces a bit more. This is actually a great gateway song to get that stubborn friend of yours to check out this band. The solos are trippy and the runtime is far more manageable than most in the genre. That’s, of course, not to say that we don’t encounter a girthy one on this record, as “Eyeshine” is an 11-minute dirge that will get you through your commute to work. Even still, the droning is scaled back just a little in favor of melody, and it helps digest this chunk of sonic hors d’oeuvre. The penultimate track, “Diablerie”, is the penultimate track that sort of splits the difference of the more succinct tracks and the meatier compositions. There are some nice which a trick ripped from Endino’s playbook, and seems to fit the band well on this track also. The finisher is the most lengthy, at almost 14 minutes, and has a lovely build up with clean guitars and snare, and the distortion sneaks in and makes this a Windhand song. The build is nice, but it’s also building to the inevitable. If you’re happy with the crushing riffs and droning vocals that are drizzled with molasses. It’s a nice send-off and shows that the band haven’t forgotten what got them to where they are. 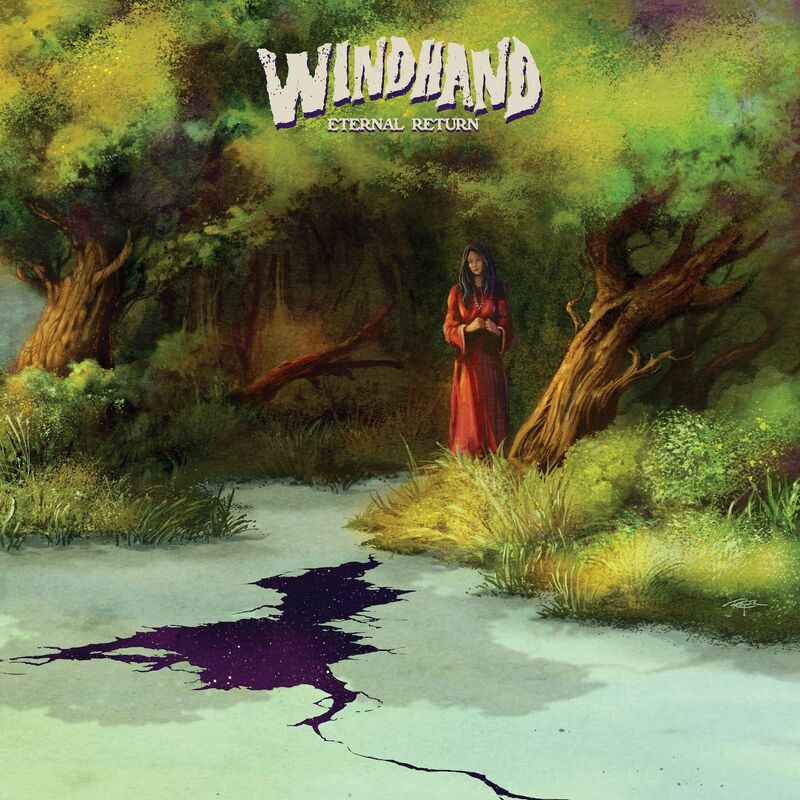 Being a mainstay in the psychedelic doom has lead to great success for Windhand, but it’s not hard to see that they were ready to try mixing things up a bit. Their slight changes here and there are noticeable, but don’t detract from the band’s sonic legacy. Focusing a little more on melody, and scaling back when the time is right. shows maturity and makes Eternal Return the finest output by the band so far. If you’re jonesing for some deep riffs and atmospheric doom, look no further. Next PostA Promise Restart Their Career With Their New Single "GEA"